Aloha Friday cultural demonstrations are held each week from 11 am – 1 pm on the porch of Volcano Art Center Gallery in Hawai‘i Volcanoes National Park. 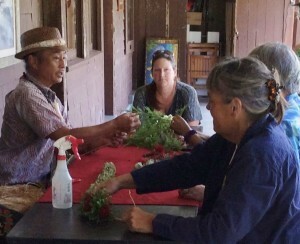 This week’s offerings include: Lei making with Randy Lee. Master lei maker, Randy Lee uses a variety of natural materials to fashion gorgeous lei from the freshest fern, leaves and flowers that he personally gathers from the rain forests of Pana‘ewa. Enjoy the skill and wonderful stories that this well-respected practitioner has to offer. These free cultural events are supported in part by a grant from the County of Hawai‘i, Dept. of Research and Development and the Hawai‘i Tourism Authority. I am excited!!! My family and I will see you tomorrow!